Birds & blossoms at Dwell Studio. 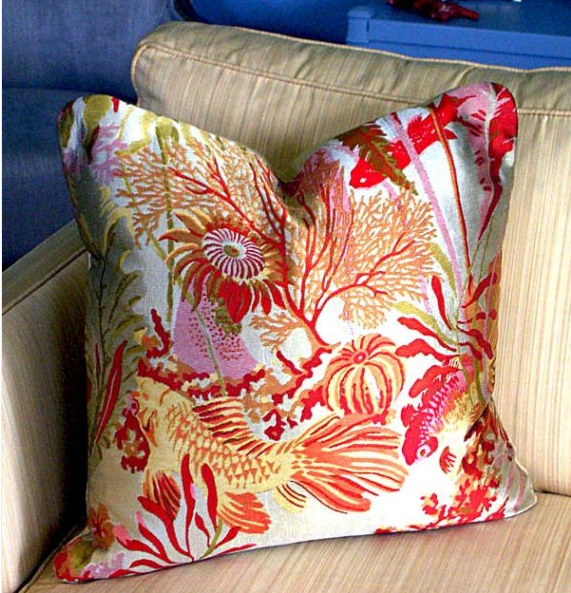 You can give your sofa or bed an inexpensive Feng Shui By Fishgirl facelift by switching out your pillows to add new pattern, texture, and color. Here are some new ones I found online. The ones above and below are from Dwell Studio and are $58 each. 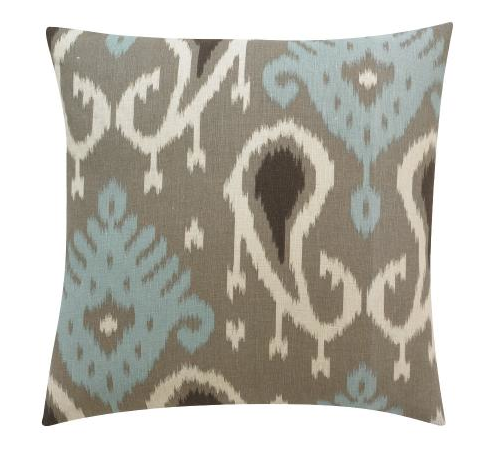 Cool faux ikat design from Dwell Studio. 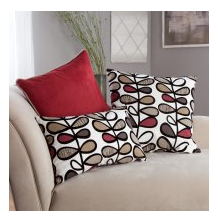 Readers: give these pillows your own personality by adding tassels to the corners or ball fringe all around. 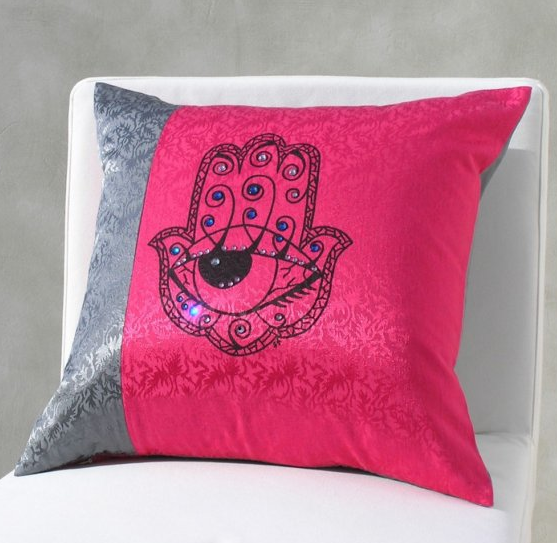 The Hamsa pillow design from StDesign Etsy Shopis $45, comes in other colors and apparently the motif is “to ward off the evil eye”. Another Etsy shop– PlumCushion–has a vast array of pillow designs. I particularly love the feng shui symbolism of koi fish on the pillow above ($75) and bamboo leaves on the one below which is from Bellacor and is on sale for $63.95 right now. 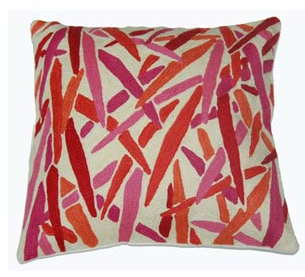 Bellacor's "Bamboo" in fuschia and coral. The Pillow Superstore packages pillows in groupings for you if you don’t have time to hand pick and coordinate your looks. I like their Amari pillow pictured here, that is $99 for the three cushions. 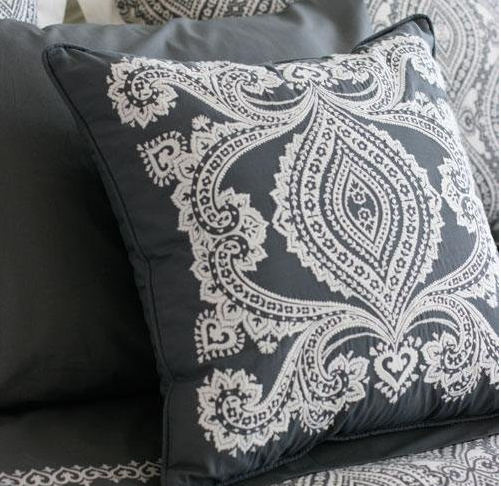 Neutral but not boring, this Amy Bucharest embroidery pillow is a steal on steel grey at Amazon. It’s marked down to $17.50! Amy Bucharest embroidery at Amazon. 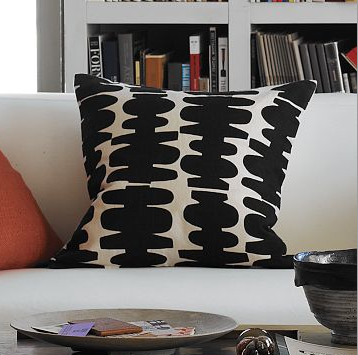 This Totem pillow from West Elm is a striking bold pattern that would waken up the chi in any room for $29. Google throw pillows, cushions, decorative pillows and find thousands more. Or, make your own. 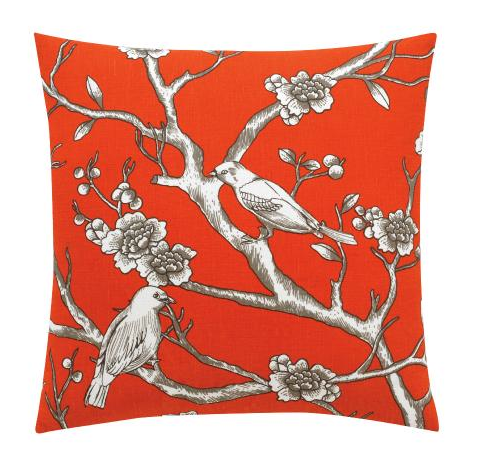 But do consider pillows as a fun way to stir up the feng shui in your space! I can’t get enough pillows, at least, that’s what I’m always thinking when I fall in love with a new one. Unfortunately most of them have different sizes and fill my too much space. So, I’ve recently decided to stop and collect matching pillow cases only. Nauli–thanks for posting! I don’t mind pillows in different sizes when they are in a group. What else do you collect?